I'm always looking at something and envisioning something else. I will find myself walking in a home and in my mind I'm tearing walls down, or I'll be shopping for clothing and start seeing curtains. 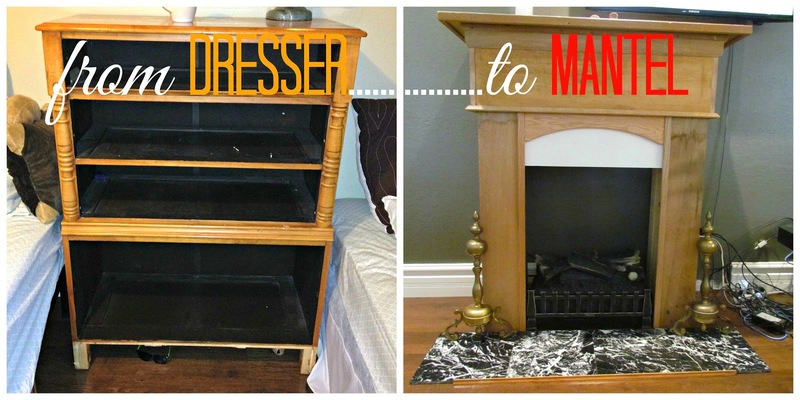 So it was no surprise to me or my husband when I told him that I was going to make a mantel out of a dresser. I've been wanting a mantel for years. We have a small electric log insert for our living area. I see our living room being more of a sitting reading room one day but until we refinish our basement its used for many things including watching TV. I framed it in....sorry no pics. I did pretty good from what I can remember about framing. I learned a bit from my dad. Seriously I basically free styled this baby, measured twice, used my level, and my square.....I think directions would drive me to the nut house. I guess rule breaking is in my blood....it a good and bad thing! Here I'm getting an idea of what size boards I want and layers. I used paper because its light and easy to work with. My favorite part was the trim. It's like decorating a cake. The wood I used was from past projects. I've learned that keeping things around can be a good thing....though it can be annoying to store. But in the end I haven't spent a dime on wood yet. I did pretty much all the work except angle cutting. Hubby helped me there. We have some black marble tile from the bathroom that I'm considering. So woodworking has been my new adventure lately. I sometimes think I should learn more in this area. I'm grateful for my husband who lets me skip cooking dinner a couple nights and lets me explore new things. More to come on on the finishing touches of the mantel....I'm so excited to have it for Christmas this year. Are you a figure it out type of person or do you have to have specific instructions? Are you like me, do you see something and think it should or could be this? What a beautiful project, Julie! Jesse is the builder around here - I have no skills in actual building but am instead am the one to come up with the ideas. :) In my own creating ways (art, homemaking, baking/cooking) I don't like to follow instructions, but put it all together as I go. Although with baking I do have to conform a bit!